We are pleased to bring you this Matchcraft Kit which includes the products needed to complete the incredible model as illustrated. The enclosed step-by-step instructions will guide you through each stage of construction until you finally achieve the finished product. The Bow Top Caravan: Based on the design of the Ledge wagon, the Bow Top is significantly lighter, and less likely to turn over in a strong wind. The design incorporated a light weight canvas top, supported by a wooden frame: a design reminiscent of the older âbender tentsâ used by the Romanichal. 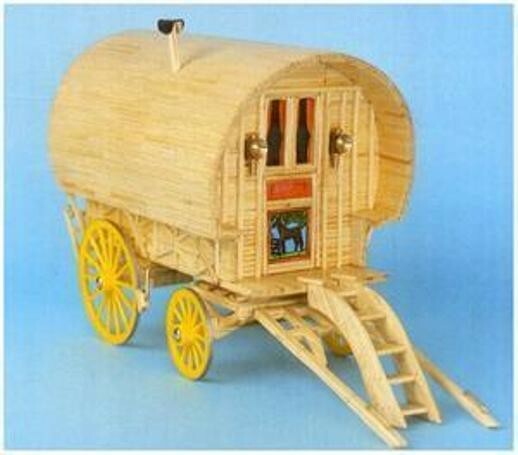 Both back and front walls of the wagon were decorated in scrollwork and tongue and groove and the wagon was painted green to be less noticeable in woodland. The inside of the Bow Top also contained the same high scrollwork or Chenille fabric, with a stove, table and double bed. Approx size of finished model: 210mm long, plus 130mm shafts, 130mm wide, 120mm high.